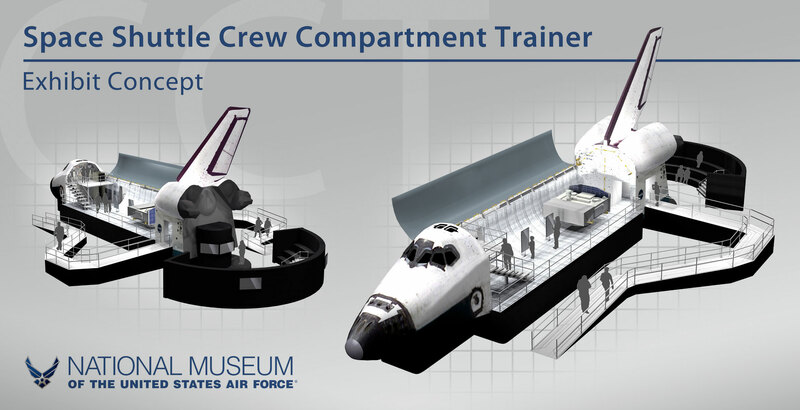 A retired NASA space shuttle crew compartment trainer is expected to arrive this summer at the National Museum of the U.S. Air Force. The CCT is a high-fidelity representation of the space shuttle orbiter crew station that was used primarily for on-orbit crew training and engineering evaluations. It was in this trainer that astronauts learned how to operate many of the orbiter sub-systems in more than 20 different classes. All Air Force astronauts in NASA's shuttle program trained in the CCT. 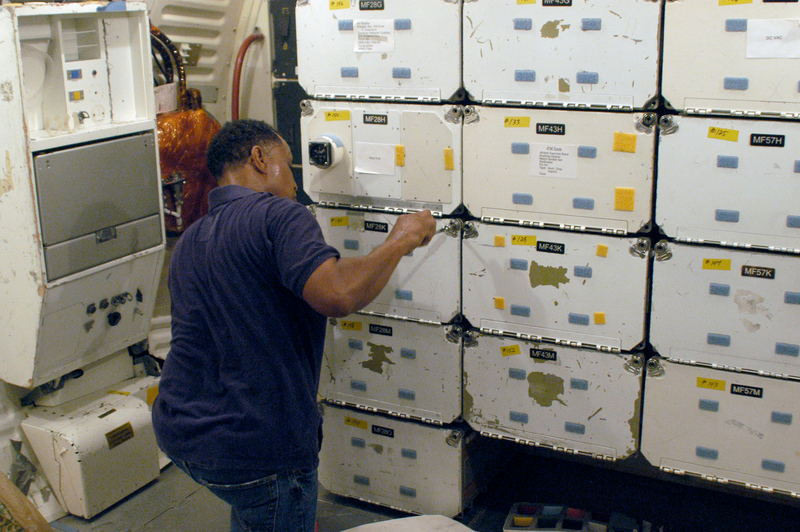 The crew module of the CCT consists of a flight deck and a mid-deck, and contains components such as panels, seats and lights visible to or used by the flight crew. Non-functional switches, connections, guards and protective devices all have the same characteristics, operating force, torque and movement as a real space shuttle. The museum is currently working with NASA to package the CCT for airlift to the museum via NASA's Super Guppy cargo aircraft, which carries outsized loads such as missile and rocket components. After arrival, technicians will offload the CCT and place it on interim display in the Cold War Gallery, before later moving it to a new Space Gallery in the planned fourth building. According to the director of the National Museum of the U.S. Air Force, retired Lt. Gen. Jack Hudson, the CCT will be a great addition to the museum. "When the CCT exhibit is completed, it will allow the public to have an up-close and personal look into the cockpit and mid-deck areas of a shuttle and learn how astronauts trained for their missions," Hudson said. "We also plan to build a full-scale mock-up of the payload bay and develop other new exhibits with an emphasis on science, technology, engineering and math to further illustrate the rich history of the Air Force's space programs and vital Air Force, NASA and aerospace industry partnerships." The new Space Gallery, where the CCT will eventually reside, is a part of a multi-phase, long-term expansion plan and will house the museum's growing space collection. The gallery will include a Titan IV launch vehicle; Mercury, Gemini and Apollo spacecraft; and many recently retired NASA artifacts such as a nose cap assembly, landing gear strut and a variety of astronaut equipment. In addition, a range of satellites and related items will showcase the Air Force's vast reconnaissance, early warning, communications and other space-based capabilities. Other new exhibits will be developed to showcase Air Force technologies with many unique characteristics in design, propulsion, payload capacity, human factors, range, speed, communication, and operating environment. One of the unique features of the fourth building will be the creation of dedicated spaces for learning. Three "Learning Nodes" will provide a unique environment for lectures and demonstrations, as well as extensions of the exhibit experience. These 60-seat "gallery classrooms" will allow staff to facilitate new science, technology, engineering and math experiences, while guest scientists and engineers from Air Force organizations, the aerospace industry, and area colleges and universities will be invited to share their expertise. Multimedia presentations will introduce students to air and space missions and the men and women responsible for their execution. When the nodes are not in use for scheduled programs, multimedia presentations will captivate public audiences. The Air Force Museum Foundation, an IRS 501(c)(3) organization chartered to assist the National Museum of the United States Air Force with the development and expansion of facilities, is in the process of raising the funds to meet the growing requirements of the museum. Currently, $38 million has been secured by the Foundation for the fourth building project, which is expected to cost an estimated $48 million. The fourth building will house the Space Gallery, Presidential Aircraft Gallery and Global Reach Gallery featuring cargo and tanker aircraft. The National Museum of the United States Air Force is located on Springfield Street, six miles northeast of downtown Dayton. Since the space shuttle's retirement in 2011, NASA has been finding new homes across the country for the retired space crafts. This video takes you to Houston to check out another piece of equipment that was just as vital to NASA's space program. Not sure, but I believe that the Crew Compartment Trainer may be on it's way to Ohio. Last week it was completely wrapped (photo below), and it's now out of the Building. Congrats to our friends in Dayton, a very special piece of space history is heading your way! The CCT won't be leaving Houston for at least a few more weeks. In the meantime, it is being moved by truck to the Light Manufacturing Facility near Ellington Field, where it will wait until the Super Guppy is done delivering the final segment of the Full Fuselage Trainer (FFT) to Seattle on Aug. 9. It will then be mounted onto a specialized adapter for its flight to Dayton. The CCT's delivery to the National Museum of the U.S. Air Force is expected in late August or early September, at the earliest. What are they going to do with that empty space at the JSC? The area vacated by the shuttle trainers in the Space Vehicle Mockup Facility is being used for Orion and commercial crew trainers, including the medium and low fidelity Orion modules and SpaceX payload trainers already in the building. Here is a nice article (PDF) about all the changes happening in the JSC vehicle mockup facility JSC (page 4). Great to see that as the shuttle trainers vacate, exciting work will continue in the facility. While I've seen the Super Guppy flying quite a few times during my Houston days, I'm sure it's arrival at the NMUSAF will draw quite a lot of attention from the locals. I'll have to bring my camera to work the day it arrives. This time-lapse video from July 2012 shows the Crew Compartment Trainer as it is prepared for transport from Johnson Space Center to the National Museum of the U.S. Air Force. The local Dayton TV news said last night that museum officials are expecting arrival next Wednesday (the 22nd) or Thursday. Here is a Dayton Daily News article with the same info. The crew compartment training module is expected to arrive Aug. 22 or Aug. 23, said Sarah Swan, an Air Force museum spokeswoman. ...construction on the new Air Force museum hangar is expected to begin next year and open in 2014. It will house the Space Galley, Presidential Aircraft Gallery and Global Reach Galley. Officials have raised more than $38 million of the $48 million for needed to pay for the expansion. Another Dayton Daily News story updating the expected arrival time of the shuttle trainer at the Air Force Museum as 4:00 p.m. Wednesday, August 22, weather permitting. The Crew Compartment Trainer was moved to Ellington Field yesterday and loaded onto the Super Guppy this morning. 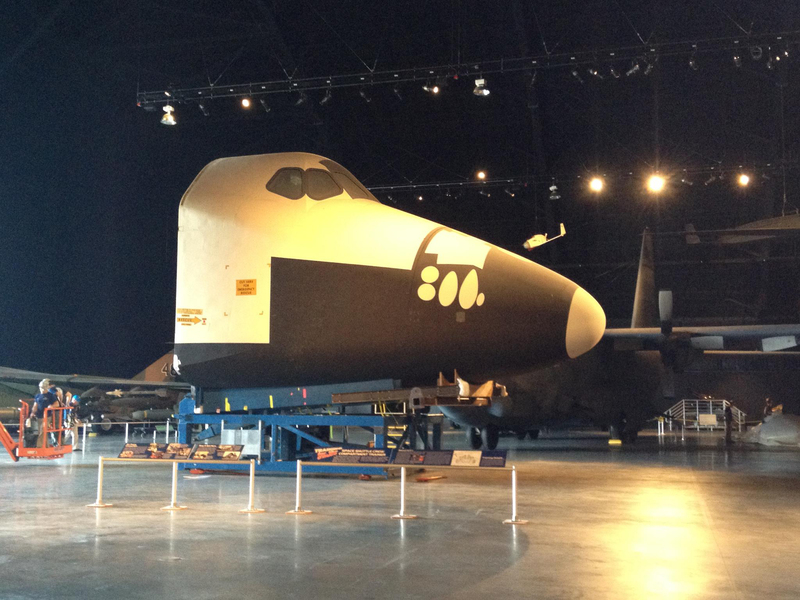 A space shuttle mockup that was used to train astronauts, including more than 75 members of the U.S. Air Force, has landed in Dayton, Ohio, where it will go on display at the world's largest and oldest military aviation museum. The Space Shuttle Crew Compartment Trainer 1 (CCT-1), which was used for more than three decades at NASA's Johnson Space Center in Houston, was flown onboard the agency's Super Guppy cargo plane to Wright-Patterson Air Force Base on Wednesday (Aug. 22). Once offloaded from the aircraft on Thursday, CCT-1 will be moved into the National Museum of the U.S. Air Force (NMUSAF), which is located at the base. The museum plans to display the trainer inside its Cold War Gallery until its new Space Gallery inside a planned fourth building is ready late next year. It may have trained more than 75 members of the USAF, but where did the MSEs, most of whom were Air Force, train? In addition to valuable exposure to shuttle systems at Rockwell International's flight systems laboratory in nearby Downey, California, the original programme relied heavily on a schedule of monthly, week-long visits by the 13 MSEs to various military satellite contractors. This proved to be unworkable and the contractor visits were reduced in favour of vists to other Air Force installations as well as the NASA Johnson and Marshall Space Centers. So, that would have been this mockup, which underwent its own recent move. The CCT is now unwrapped and on display in the Cold War Gallery. 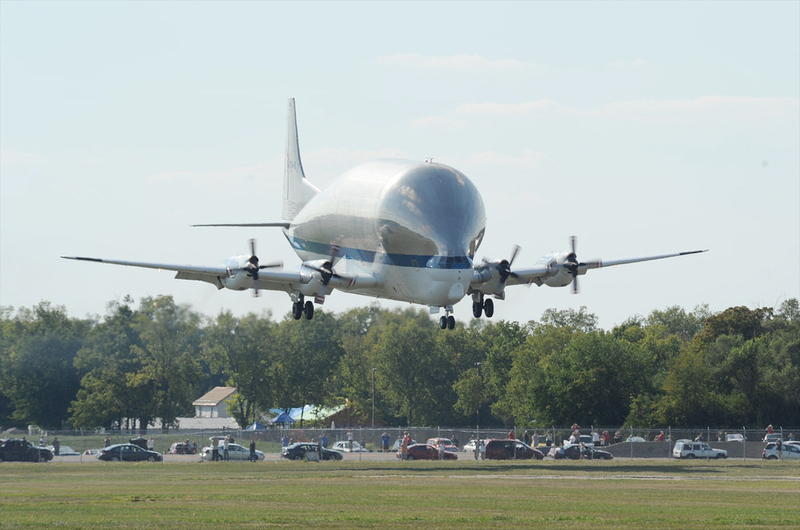 Did they land the Super Guppy on the runway next to the museum or truck it over from the main Wright-Pat air field? I wondered if that strip was still active or not. The Museum's airstrip (the old Wright Field strip) is officially inactive (you'll see the big "X"s painted on it from the air), but the museum uses it on special occasions for fly-ins (like the Doolittle Raiders earlier this year) and for bringing in aircraft that are joining the museum's collection. Had they received a shuttle, could they have landed it on that strip? I'm guessing runway length and overall vehicle weight would have forced a landing at the main base. Landing the SCA with the shuttle at the NMUSAF was the subject of some debate and was mentioned (by me, among others) during the cS debates on where the retired shuttles should go. The final determination by the museum was that the SCA could land just fine, but the runway was a bit short of NASA's requirements for the 747 to take off again. The runway length is within its capabilities (the SCA is nicely overpowered when empty), but didn't have enough margin of safety. It would've required some sort of waiver on NASA's part. Officials with Team Raytheon based at Johnson Space Center's Space Vehicle Mockup Facility have teamed-up with the National Museum of the U.S. Air Force's Restoration staff to re-install interior items on the Crew Compartment Trainer (CCT-1). The interior items, which include seats, lockers and monitors, were removed and transported to the museum in advance by truck in order to reduce the weight of the CCT-1 during its flight on NASA's Super Guppy aircraft. 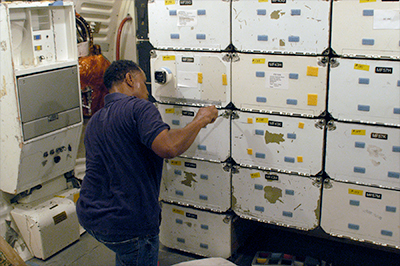 Above: Team Raytheon mechanical engineer Rob Evans reinstalls items inside the Crew Compartment Trainer on Sept. 6, 2012. It will take several days to repopulate the interior of the CCT. According to Team Raytheon Engineer Clayton Hamm, reinstalling the interior items on the CCT-1 has kind of been like putting together a giant puzzle. "First, you have to fully evaluate it and locate all of the pieces and then proceed in a methodical manner so that the pieces are brought into the trainer at the right time in order to make them all fit," said Hamm. "Once everything is organized, things tend to move along smoothly, but once in a while something will surprise you or require extra time to install." Assisting Hamm has been a team of restoration staff led by Restoration Specialist Nick Almeter, who has over-seen the project since the CCT-1 arrived at the museum. "Everything has come together really well, and it has been great to have the engineers from Team Raytheon and the Space Vehicle Mockup Facility here to assist us," Almeter said. "They have a wealth of knowledge about the CCT-1, so it certainly makes our job that much easier." Even after the re-installation is complete, work on the CCT-1 exhibit will continue. Plans call for the museum to build a full-scale mock-up of the payload bay and develop other new exhibits with an emphasis on science, technology, engineering and math (STEM) programs. When completed, the CCT-1 exhibit will allow the public to look into the cockpit and mid-deck areas of a shuttle and learn how astronauts trained for their missions. These surrounding exhibits will contain additional items that NASA plans to ship to the museum, including the main/nose landing gear wheel and brake assembly; nose cap assembly; photographic equipment; primary thruster; rotational hand controller and mid-deck sleep station. Other uniform items such as an inflight jacket, cooling vest, and an in-suit drink assembly bag have already been received. Although a firm completion date for the full exhibit is yet to be determined, the CCT-1 itself, along with a display detailing future plans including a video documenting the trainer's preparation and delivery, will be available on Sept. 29. I'm a bit curious about: "the public to look into the cockpit and mid-deck areas...". It won't be great viewing of the flight deck in through the aft windows. The mid-deck does not have windows at all. How will they do it? I can't tell from the graphic, but are they going to open it up somehow? NASA Astronauts Michael Good and Michael Foreman visited the National Museum of the Air Force during a private event to formally introduce the first shuttle Crew Compartment Trainer (CCT-1) to military and community officials and preview the next steps for the exhibit. The event marked the debut of a new kiosk, which contains additional information about the trainer, including graphics and a mini- documentary detailing how the CCT-1 was used, its arrival at the museum and future exhibit plans. As the event began, Foreman reflected back on the many hours he spent in NASA's three crew compartment trainers as he prepared for space missions. "I've spent 400 - 500 hours in these trainers so it evokes all kinds of great memories," Foreman said. 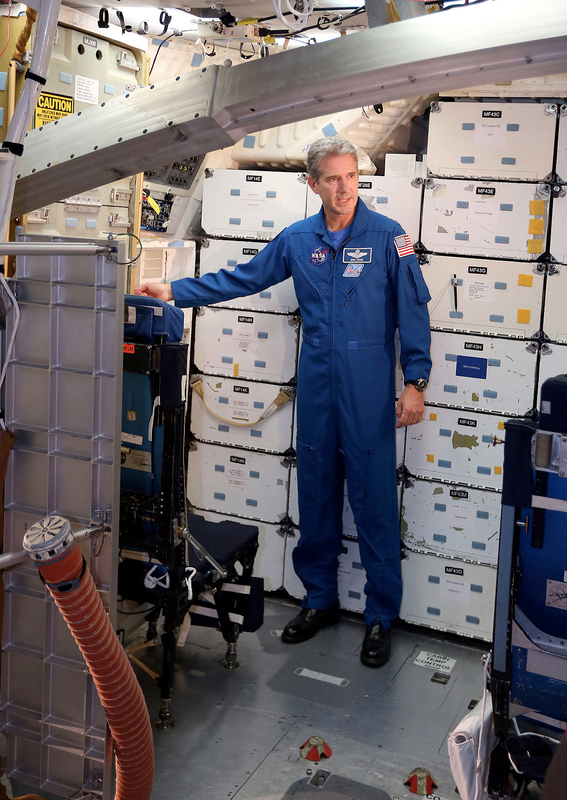 "These trainers were great for actually strapping in and getting ready for launch, and now people will get to see up-close where we trained for space shuttle missions." Good, who served for 25 years in the Air Force, said he couldn't think of a better home for the trainer to inspire the next generations of scientists and engineers. "I really love air museums and I remember coming here with my family as a kid, and it is one of the things that inspired me to study aerospace engineering and to get into this business," Good said. Above: NASA Astronaut Michael Good discusses the capabilities of NASA's first shuttle Crew Compartment Trainer at the National Museum of the U.S. Air Force in Dayton, Ohio, on Sept.28, 2012. Good also spoke about how valuable the CCT-1 was to the shuttle program and the reassurance it provided the astronauts. "People sometimes ask me if I was scared sitting on top of that rocket prior to launch, and I can honestly tell you that I was not scared," said Good. "The reason I was not scared is because I was so well trained, and this mockup was a big part of that." 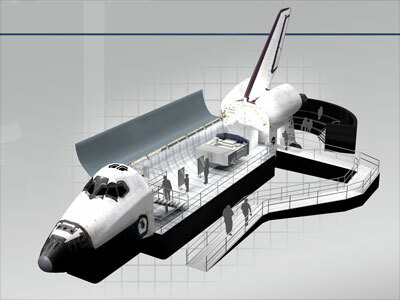 Future exhibit plans will start with Display Dynamics Inc. of Clayton, Ohio, which was recently selected to reproduce a full-scale mock-up of a NASA shuttle payload bay, engine and tail sections and a dedicated educational area. These pieces of the exhibit, along with visitor observation and access structures, are scheduled to be completed by September 2013. The museum will continue to populate the exhibit with additional artifacts, such as satellites, along with items obtained from NASA, including space gear, hardware and other equipment, through early 2014. During construction of the exhibit, visitors will be able to view the CCT-1 in the Cold War Gallery. 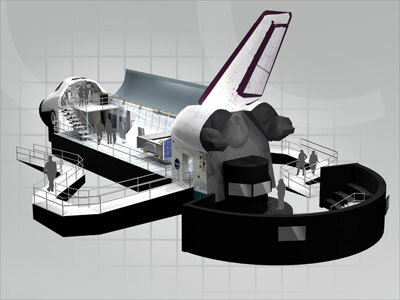 When completed, the exhibit will allow the public to look into the cockpit and mid-deck areas of a shuttle and learn how astronauts trained for their missions. The museum's director, retired Lt. Gen. Jack L. Hudson, concluded the event by expressing his thanks to all those in attendance and is looking forward to the exhibit's completion. "The vision is grand here and we're on a pathway to do this," said Hudson. "This will be an enormous addition to the museum as the CCT-1's exhibit capability grows over time and will help us continue to tell the Air Force story to the American public as well as motivate, inspire and educate our youth towards the Air Force and science, technology, engineering and math." In addition, three other CCT-1 exhibit contracts were recently awarded to add further content to the display. A contract to build five reproduction space suits representing the space shuttle and Gemini programs was awarded to David Clark Company, Inc., of Worcester, Mass., in the amount of $175,000. A contract for science, technology, engineering and math learning node elements, including two space shuttle landing simulators and 10 touch-screen computers was awarded to Historic Space Systems of Danville, Ohio, in the amount $170,400. Finally, a contract to develop fourteen 1/32-scale models of U.S. space launch vehicles representing an historical overview of U.S. Air Force and NASA programs, and one full-scale model of the Explorer 1 satellite was awarded to ProTek Models LLC, of Rancho Cucamonga, Calif., in the amount of $70,900. The space launch vehicle models will include a Jupiter C, Mercury-Redstone, Mercury-Atlas, Gemini, Titan II, Thor-Agena A, Titan IIID, Atlas-Centaur, Saturn IB, Saturn V, Delta II, Titan 4B, Atlas V, and a Delta IV Heavy, along with a space shuttle with a "full stack" of launch vehicle elements. I got a chance to visit the Space Shuttle Crew Compartment Trainer today at the National Museum of the US Air Force in Dayton, Ohio. Thought some of my fellow cS members might enjoy seeing it. I posted a public album to Facebook, so you should be able to see it. But if you can't (and anyone wants to see it!) I'll post them online elsewhere. Great pictures, thanks for posting! I was wondering how the AFM CCT display was progressing... It looks like they opened a public access passage in back near the airlock port. To my untrained eye, that is a bit different than the 'plan' diagram at the top of the thread. I wonder if they still plan to finish the full display, or are changing their plans. There were two Crew Compartment Trainers (CCT-1 and CCT-2) and one Full Fuselage Trainer (FFT). CCT-1 is now in Dayton. CCT-2 is remaining in Building 9 at Johnson Space Center for now, on hold for Space Center Houston. If I recall correctly, the trainer will be in the new building once constructed. The display will not be built until then. Although I'm glad Dayton received something, I was really disappointed when I seen the trainer. You just don't get "the feeling" of standing in the greatness of space history that would have been provided by a real spacecraft. I had more of a "meh, it's a tool", feeling. Yes, I suspect it was important and all, but just isn't anywhere close to the same. Kinda like forth place in the Olympics. You just don't get "the feeling" of standing in the greatness of space history that would have been provided by a real spacecraft. I guess it is a matter of perspective. Long before I ever got near a real space shuttle, let alone climbed in one, I visited Johnson Space Center and had the chance to climb into CCT-1. To say that the experience was thrilling would be an understatement. At the time, I had no idea if I would ever come within an arm's length of a flown orbiter, but it didn't matter because I could picture John Young and Bob Crippen sitting in CCT-1, training for STS-1. That was more than enough to inspire visions of history. I'd second that opinion... 15 years at NASA, and I have had the privilege of sitting in Atlantis. However only just recently was I able to tour the inside of the CCT. It's so identical to a real orbiter, it is indistinguishable. Being inside a CCT is almost as thrilling as being in a real orbiter. You really can't tell the difference. These are not re-creations for educational purposes, they are the actual trainers our astronauts used preparing for flight. You stand where they trained. I’m sure when the Air Force museum finishes up the display; the exterior will also be very impressive. The world's largest military aviation museum is about to get bigger. The National Museum of the U.S. Air Force is set to expand its legacy with a new 224,000 square foot building to be constructed by Turner Construction Co. of Washington, D.C. The contract for the museum's newest building, which will be similar in size and shape to its three existing hangars, was awarded by the U.S. Army Corps of Engineers, Louisville District, for the amount of $35.426 million, and is being privately financed by the Air Force Museum Foundation, a non-profit organization chartered to assist in the development and expansion of the museum's facilities. Current plans call for construction to begin in late spring 2014 and be completed in the summer of 2015. The museum will then begin populating the building that fall. A public opening is anticipated in late 2015. The Air Force Museum Foundation recently gifted the funds necessary to begin construction of the building and will continue fundraising toward their campaign goal of $46 million, which would provide additional options and amenities for the building. Since its inception, the Foundation has contributed more than $85.6 million for museum construction, expansion and facility upgrades. I agree, having been in a flown orbiter once, you cannot tell the difference inside a trainer like this. I've been in the one in Seattle twice now and it never gets old. People at first griped loudly that the museum didn't get a flown orbiter (especially as it was one of the few museums that had the building already built for an orbiter and Boeing support to get it off the SCA), but I think now that plenty of people have gotten to go tour the inside, knowing they could never do that with the museum orbiters, people generally feel it was perhaps a better deal. Public can get inside your trainer? It is my understanding you will only be able to "look in" the Dayton trainer. As the illustrations above show, the Museum of the U.S. Air Force is planning to configure/alter the CCT-1 trainer, such that the public will be able to look into both levels of the crew cabin. In Seattle, which you can read more about and discuss here, retained the original structure intact, but offers a premium tour for small groups. A historic mockup of a NASA space shuttle crew cabin has grown wings and a tail to launch as the newest exhibit at the National Museum of the U.S. Air Force in Ohio. Set to debut Wednesday, Feb. 26, the Dayton museum's Space Shuttle Exhibit was built around NASA's first Crew Compartment Trainer (CCT), which has now been outfitted with a full-size representation of the shuttle's payload bay, engine and tail sections. 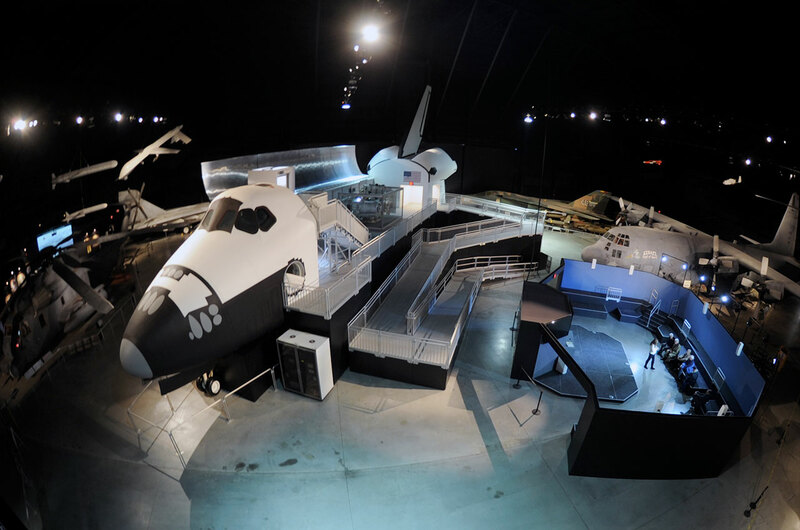 The new exhibit offers museum visitors the opportunity to experience the size and shape of an actual space shuttle orbiter by entering through the 60-foot-long (18 m) payload bay and looking into the trainer's flight deck and mid-deck levels. The ramps that lead into and out of the new display form the shape of the wings for the replica vehicle. Got to see the Crew Compartment Trainer last spring with fellow collectSPACE members Mark and Brad and looking forward to seeing it in its new configuration. This weekend I had the opportunity to visit the museum. First off, I still believe Dayton deserved and would have been a better selection for a shuttle. With that said, they did a fantastic job creating the shuttle in spirit! It is a top notch display that has room to grow. I enjoyed the simulators and the ability to get just about inside the display. I really think the next step should be the acquisition of a high fidelity simulator that can be sat in with supervision. I shot some photos in an effort to highlight the atmosphere of the display. The National Museum of the U.S. Air Force's Space Shuttle Exhibit and Science, Technology, Engineering and Mathematics (STEM) Learning Node will close beginning Aug. 3 in preparation for its move to the fourth building. 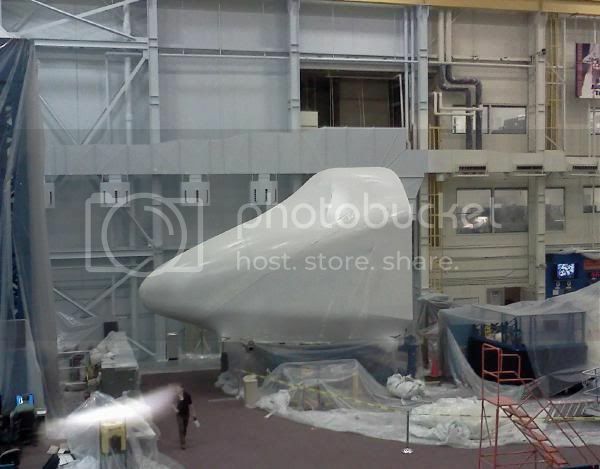 Plans call for the Space Shuttle Exhibit to be disassembled, transported to the fourth building, re-assembled, and re-opened when the fourth building opens in spring 2016. The current STEM Learning Node will be moved to the fourth building's Global Reach Gallery, and two new additional STEM Learning Nodes will be constructed, with one located between the new Space and Research & Development Galleries and another in the new Presidential Gallery. Aircraft and exhibits located near the current exhibit in the Cold War Gallery, including the AC-130, EF-111A, F-111F and F-117A, will be unavailable starting Aug. 3 for approximately three months as the work to dismantle the Space Shuttle Exhibit takes place. According to Museum Director Lt. Gen. (Ret.) Jack Hudson, although the closure of the Space Shuttle Exhibit will be inconvenient during the busy summer visitor season, the new Space Gallery will definitely be worth the wait. "The new Space Gallery in the fourth building will be phenomenal," said Hudson. "We'll finally be able to display all of our space-related aircraft and launch vehicles, including the Titan 4B, in one location, and along with the exhibits and newly designed STEM Learning Node, we'll be able to provide an immersive experience that inspires and educates visitors of all ages about the important role of our Air Force in space." The $35.4 million fourth building, which will also house the new Presidential, Research & Development and Global Reach Galleries, is being privately financed by the Air Force Museum Foundation, a non-profit organization chartered to assist in the development and expansion of the museum's facilities. With construction well under way, the foundation continues to fundraise toward their campaign goal of $46 million, which would provide for further options and requirements such as the STEM Learning Nodes and wireless capability in the building. Copyright 2016 collectSPACE.com All rights reserved.